Want some background on a religious topic from people you can trust? 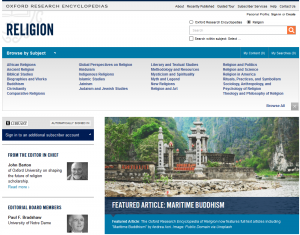 Browse to Oxford Research Encyclopedias: Religion, where you’ll find articles about subjects like African Religions, Hinduism, Religion and Art, and Religion in America, among other categories. All of the articles are written by scholars who work in the areas they’re writing about (Vanderbilt’s William Franke has an article on “Poetry, Prophecy, and Theological Revelation.”). The content is quite up-to-date, and the resource adds new material every month. Each article includes a bibliography; use the find it@VU button to see whether we have an item.